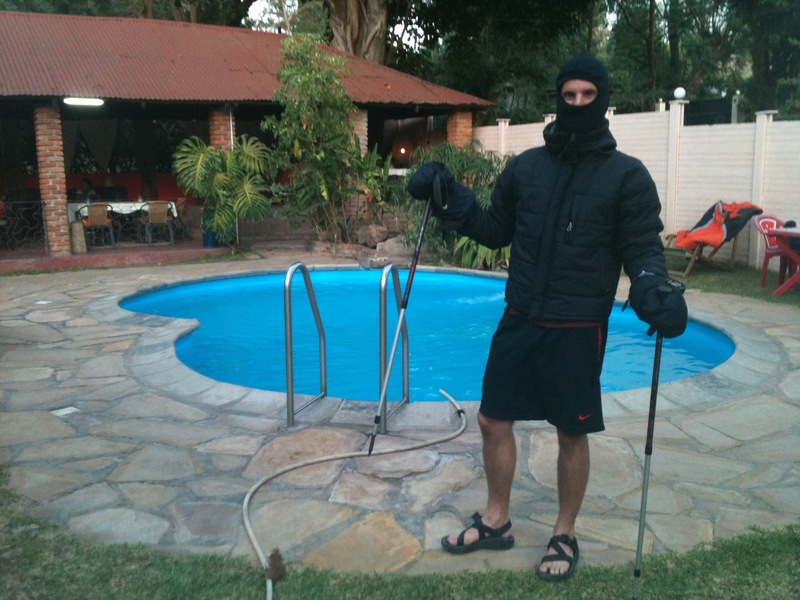 After preparing for my Kilimanjaro climb, here are some of the highlights from my trek. 6:30 am Last hot shower at the hotel is not hot. There also isn’t any water. This is a most displeasing send-off. 7:30 Meet my fellow hikers: 2 Canadians and 3 people from the UK. They all seem like strong hikers. 3:00 After a 4 hour drive, a 2 hour delay with our permits, and a tasty lunch, we begin hiking. Today is only 3 hours of hiking at low altitude — so not bad at all. 6:00 We make camp with our first really great view of Kilimanjaro on the horizon. We have a long way to go. 9:21 Lights out. Much colder than I thought it would be at this point. I can see my breath inside the tent — and we’re only at 2600 meters. 6:15 Rise and shine. Slept decently. Was actually hot in my sleeping bag during the night — a very good problem. Our tent was on a bit of hill, so I felt like an inch-worm in my sleeping bag during the night trying not to wind up at the bottom of the tent. 7:15 We’re off. We make good time, passing a couple groups . We’re the first group to Cave 2. Cave 2 is the second cave we stopped at… I still haven’t figured out the naming convention. People used to camp in them, but after a cave-in, it’s no longer allowed. The clouds clear for a while and we have some great views of the summit. 12:15 After a delicious lunch, we hike for another 2.5 hours arriving at Kikelelwa Camp at 3 pm. It was a really nice walk, passing through some very diverse landscapes. We’re still not really feeling the altitude yet, but there is supposed to be a bit of a lag. We’ll see how we feel later, but a quick run to the tent leaves me panting. 4:00 It starts sleeting and goes strong into the evening. We’re very grateful that it waited until we’d made camp. Not looking forward to walking in the rain. 7:00 The clouds are below us when we wake. They quickly rise as the sun comes up. I slept through most of the night. 8:45 We start out on our hike. Today, we hike up over a pass at 4500 meters, before we drop back down to 4300 meters where we camp. It’s steeper than yesterday, but not by much. Nevertheless, we can start to feel the altitude as we walk. It’s not bad, but it keeps us to a slightly slower pace than the previous day’s. On the hike I drank 2.5 liters of water – we’re drinking as much as we can to help us acclimatize. It’s also getting a lot colder. We need longsleeves and gloves now as we hike and a down jacket in camp. 11:15 We arrive at Tarn camp. It’s midday, but very cold. The clouds pass through camp at a pretty good clip. When the sun shines, it gets really hot very quickly and when hidden by clouds the temperature plummets just as fast – probably a 10 degree Celsius swing in just a couple minutes. We’re drinking a lot of water now, as much as as can – I’ve never been so hydrated in my life. Unfortunately, what goes in, must come out. Compounded by the volume we’re drinking, the kidneys produce more urine at altitude generating endless trips to the bathroom. This is not fun during the subzero nights. 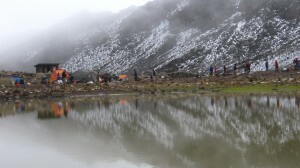 4:00 We leave camp for an acclimatization hike. We hike up 300 meters in sleeting rain and spend 20 minutes on top of a ridge to trick our bodies into acclimatizing to that altitude. The rain clears when we get to the top and I see my sun dog for the first time (a rainbow formed around my shadow). This little know phenomenon is associated with the origin of many superheroes. Then we head back down and arrive just in time for it to start sleeting again. The rain continues until we sleep. 6:30 We wake to clear skies and ice caking every surface of our tents. 8:10 We set out for our 5 hour hike. The ground is frozen from the previous night, but the skies are clear bright blue. 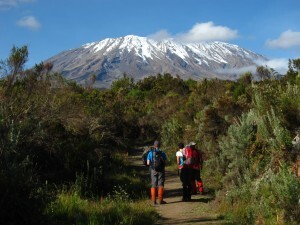 We get some magnificent views of Mawenzi Peak as well as Kibo Peak as we cross the saddle that joins them. I call Sasha and wish her a happy Valentines Day. 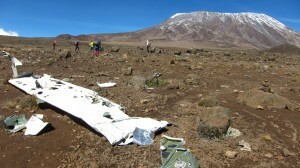 We pass the remnants of a plane that clipped Mawenzi Peak before it crashed. Apparently, the four people aboard didn’t see it in the fog. The tail section is nowhere to be found. We get as high as 4600 meters and can see Kibo Camp, a launching point for many before the summit, just up the trail, but we turn right and descend to our camp at 3900 meters. Walking downhill is quite a trip, because the cloud layer is beneath us. Today’s walk is relatively easy. 8:00 After some reading, napping, a failed trek for cell service, and a dinner of warm stew, we head to our sleeping bag. This is our last chance for a good night’s sleep before the summit attempt. 6:30 I wake after a pretty good night’s sleep. 8:00 We start our hike up to the School Hut Camp. Again, we are blessed with stunning weather. It’s a 900 meter climb to our highest point yet. It’s our steepest hike so far, but since we’re acclimatized, it feels pretty good. We made good time and arrived ahead of schedule again. Now we need to eat and get as much rest as we can before midnight. 7:00 We finished dinner and our briefing. This next hike is clearly going to be a lot more difficult than all of hikes to date. We’ve been warned that it is likely to be windy, a factor that will make everything a lot colder. I’m typing this from my sleeping bag. We hope to get a couple hours of sleep before we leave. I’m skeptical. 11:00 We wake (1.5 hours sleep, yay) and get on our summit gear — six layers on top and 3 on the bottom. We eat some oatmeal and drink some Ginger tea. 12:00 AM We depart for the summit. The trail is steep and we have a pretty good pace. Despite the cold temperature, I strip to two layers given how hard we’re working. Frost is building up on our backpacks and the hoods of our jackets. We pass a group that was pretty far ahead of us. My water bladder hose is frozen and unusable even though I was blowing the water back into my backpack. The moon finally rises and glows orange in the horizon. 1:45 AM We start a series of switchbacks through skree. This is supposed to be the hardest part of the climb. As we look down, we can see trails of headlamp lights from the groups below us. We’re pretty far ahead of everyone. It’s getting very cold. My fingers start to tingle from the cold all the way to palm through my light gloves. 4:08 We arrive at the rim of the volcano, Gilman’s Point. I dont know what his point was, but at 5,681 meters I’m not really interested. This is the highest I’ve ever been outside of a plane. At this point, every breath I take is to the capacity of my lungs. My diaphragm is getting sore from my breathing. It’s also getting really cold. At this altitude it is harder for our bodies to generate warmth (though that doesn’t seem to be a problem for me, except in my hands), insulation is less effective, and it’s getting colder the higher we go. Between the breathing and the cold, I’m too tired to do much more than the necessities. The wind is picking up a lot, so I add my windbreaker and my big down mittens. Our guides are good enough to have brought up hot Ginger tea. I gulp this down and it warms me up a little. We have an hour and half to go not including breaks. 4:45 I’m not sure what time we passed Stella Point, it wasn’t a terribly exciting moment for us — we’re focused on the summit. The grade of the slope has gotten much easier, but the breathing is still quite labored. My fingers are cold even inside the huge down mittens that have hand warmers inside. 5:20 We can see some flashlights near the peak, we know we’re close. It’s finally starting to sink in, we’re going to make it. We stop briefly for rest. Our guide looks into my eyes, pulls down my balaclava, and asks me to stick out my tongue. I’m tired, but feel fine. He’s not doing this to anyone else. I’m terrified he’s going to tell me I have to turn around when I’m so close. He asks me if I have a headache. I tell him “no, I feel fine” and we continue on. Whew! 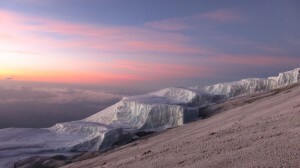 5:42 Uhuru Peak, Kilimanjaro highest point. We made it. It’s still very dark, the sun’s light hasn’t even started to show on the horizon. We are the second group to summit today and every one of us made it. We exchange hugs and congratulations. In my tired state, I’m filled with emotion. I’ve completed something I set out to do a long time ago and pushed my body to new heights – pun intended. We’re tired and it’s so cold, -25 C with windchill, that taking pictures is not at the top of my list. We dance around to keep warm. After a couple of group photos, I summon the willpower and, with the aid of my partner in arms Alex, take the obligatory summit shots. I was lucky my camera was still working since the cold had turned a few other camera batteries into paperweights. Finally, the first glow of pink shows on the horizon and we start to head down. At the summit. I’m really cold. 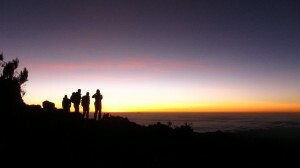 6:30 am I’m not paying too much attention to time at this point, because the sun is rising in the sky uncovering stunning views of Kili’s glaciers, the volcanic crater, and a never-ending horizon. It also reveals hordes of people wearing some of the most agonizing expressions I’ve ever seen. Up until this point, we haven’t seen many other people on our hikes, but the path back to Gilman’s Point is a traffic jam. Along the way, I overhear some words of encouragement like “You got here on willpower alone. No one is going to fault you for turning around at Stella Point.” Luckily, descending isn’t nearly as difficult as ascending. The temperature, still cold, is quickly rising. Some of the remaining glacier. 7:25 am While I didn’t really face the difficulties I’d heard from others about skree slope going up, I enjoyed every minute of the descent. Little know fact: loose gravel on a steep slope gives you temporary super-powers. Taking huge strides and sliding on the gravel every time my foot makes contact allows me to descend 1000 meters by essentially running straight down. In 30 minutes, I went down what took almost 4 hours to go up. By this time, I’m peeling off every layer I can. About half way down, I take a break and call Sasha to tell her the good news. 8:00 am We have breakfast in Kibo Camp and celebrate our accomplishment. 9:45 am We leave Kibo Camp and follow an easy path to Horombo Camp enjoying the beautiful weather and daydreaming about sleep. 6:00 We leave camp for another relatively easy walk out to the gate just in time for yet another glorious sunrise. The cloud layer is below us for the first couple of hours. Then we enter the forest, which provides some welcome shade and mischievous monkeys. Beware of the Black and White Colobus Monkey, they have very good aim — did I mention they were feces throwers? 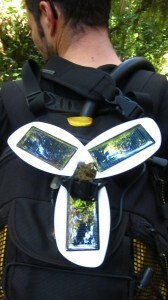 My new friend Darryl, received a small gift square in the middle of the solar panels on his backpack. I didn’t see them, but others in my group saw a troop of blue monkeys. 11:00 am We pass through the final gate. We’re the first group out today. We’re dirty, desperately in need of shower, and have some sore muscles, but are generally quite pleased with ourselves. Below is a map of the trek. aggresive at times…you reminded me of a scary sprint from our tent to VW Beetle at Amboseli. Eyeopener! Congratulations to you and your fellow climbers to the summit! So happy that you had mostly clear views!! Congrats Josh! I just got to reading this full post. I’m so happy you made it – it sounds amazing and can’t wait to hear more details when you get back to the states! Wow, after a few weeks (or months?) hiatus suddenly you came up with this exciting news! 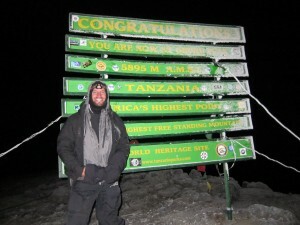 Congratulations for having conquered Mount Kilimanjaro!